In the contentious world of elite New York pinball, there can be only one champion. 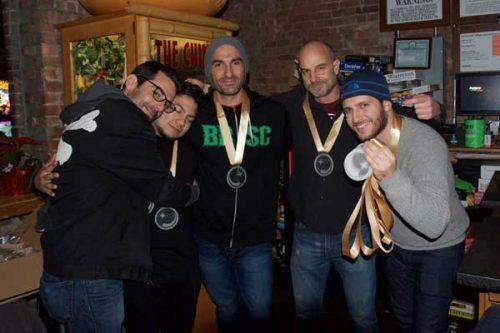 This year, it was a North Brooklyn contest: Greenpoint’s Paragons of Pinball duked it out in the final round against Williamsburg’s Terrorwrists at Sunshine Laundromat (860 Manhattan Avenue). The Terrorwrists took the title. Pinball is a fast-paced, high stakes enterprise. New York’s urban planning and infrastructural changes are much slower beasts. And so: the Brooklyn-Queens Connector (BQX), also known as the gentrification express. This is The Streetcar Not Everyone Desires. With more and more funding necessary, but less and less actual money secured for the project, the BQX is stalled behind schedule, and seems, for now, to be more of a pipe-dream than a real possibility. Speaking of transportation going off the rails, an unoccupied car was found partially submerged in Newtown Creek this morning. As of yet, there is no information on the condition, whereabouts or identity of the driver.